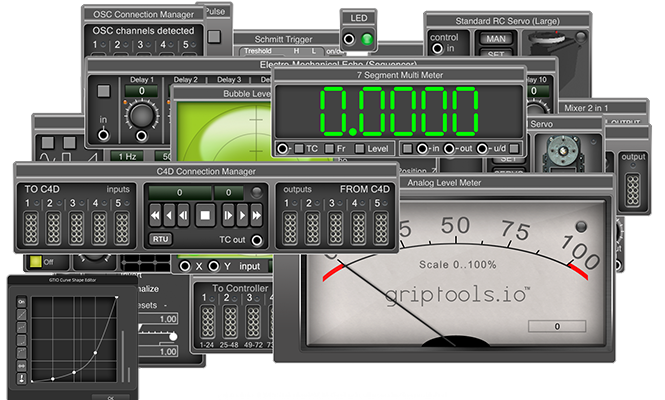 griptools.io is visual design software for motion-graphics and mechatronics projects. It's all about connecting and controlling: virtual-3D to physical and vice versa, even physical to physical. 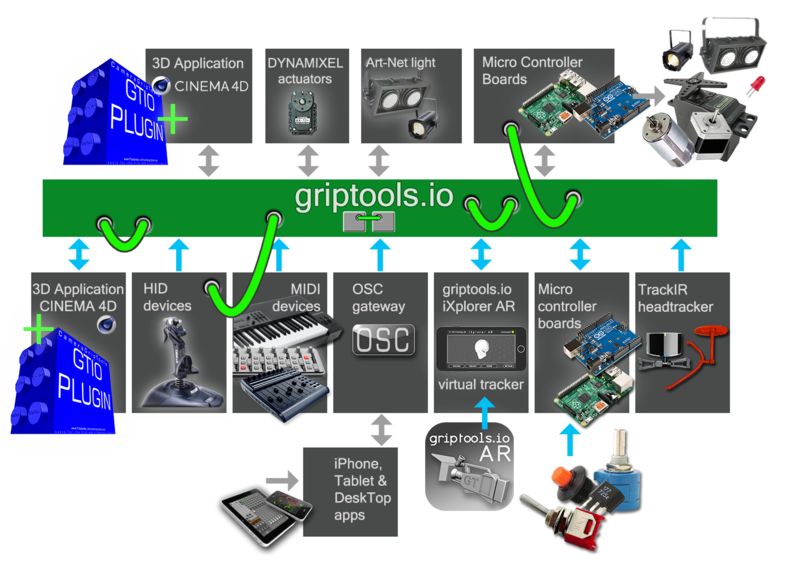 griptools.io has build-in support for game HID devices, MIDI, OSC, motors, external controllers, lighting, mobile devices plus 2-way support for the 3D-graphics application CINEMA 4D. You can use and combine all this hard- and software in one cross-media project. griptools.io allows to build rich projects in a very short space of time. griptools.io is your sketchbook, breadboard and finished project at the same time. all in in one. griptools.io comes with a myriad of 'Nodes'. 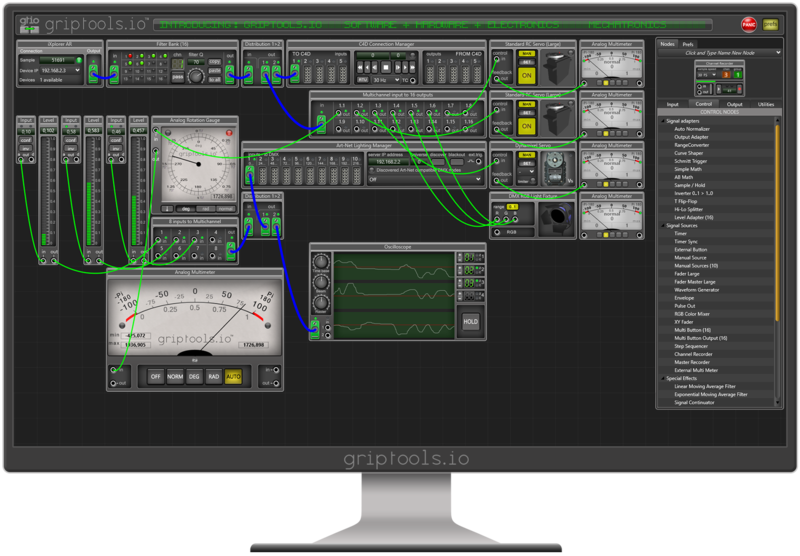 A node in griptools.io is a small virtual instrument, with a 'smart' interface. There are nodes that offer a bidirectional gateway to external software and hardware. Others can generate, change, or visualize signals. Used in a network, the nodes take an input, manipulate the information and send the result to a next node. The nodes together in a network, build very powerful projects. OSC input manager, C4D input manager, External Controller Manager, Precision Timer, Sample Recorder, Automation Fader, Analog Multimeter, Analog Rotation meter, RGB Color Mixer, Digital Multimeter, Waveform Generator, Oscilloscope, Step Sequencer/Editor, and many more. Please have a look at the detailed descriptions. How do you build a griptools.io project? Virtual wires are an easy, intuitive and visual way of connecting. Just drag the nodes from the Node Tabs into the project and use the mouse to connect or disconnect on the fly. Is griptools.io easy to use? YES! griptools.io is very visual and intuitive to use. The "HelpCard" system: one mouse click on a node opens a description of the functionality plus usage examples of that particular node (also available on the site). The Message Bar (top of the screen) gives contextual information when the mouse hovers over nodes or connectors. There are lots of video's demonstrating various projects (Vimeo, YouTube). 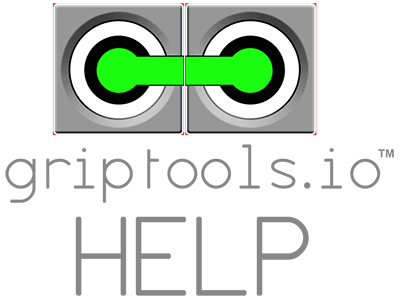 The comprehensive griptools.io “User Guide” and the “Xtension Guide” offer in-depth information (free downloads). Based on a variety of nodes, interconnected by "virtual wires"
griptools.io is your sketchbook, breadboard and finished project at the same time. IO with external controllers to use motors, lights (DMX), servo's etc. CINEMA 4D plugin to control virtual 3D-graphics objects by tapping into the C4D internal data stream. griptools.io can use the tremendous power of a modern 3D-graphics application like CINEMA 4D, to control complex external hardware by implicitly using math techniques like inverse kinematics, calculating motion in 3D-graphics space. Or vice versa, animate virtual object properties with hardware. We are very keen to hear what you think of this project. Please let us know. If you are interested, please send us a message. We will keep you informed about its progress and highlights by a regular newsletter.